Great news. What other Constitutionally protected right do you have to pass a test and pay for? To operate a radio transmitter. That is federal, if I'm not mistaken. Oh and back on the topic. This is great progress. Thanks for the update Molly. P.S. Could you check my supporting member status. Constitutional protected rights don't end at your doorway threshold, so if even if the wording of a final ruling is narrow it should be easy to expand upon. And even in the interm a ruling that no FOID is needed to own/possses guns in your residence is a HUGE step forward in this state. Yes, but until the FOID is gone completely, it's still a roadblock. 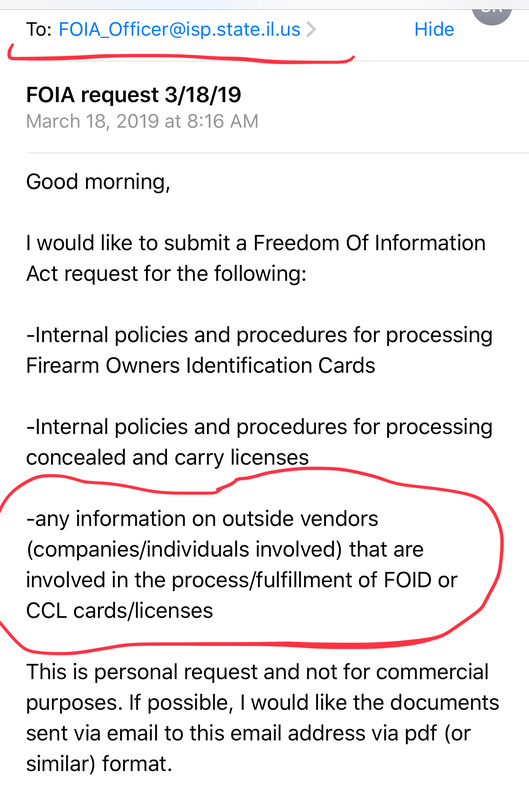 So I don't need a FOID to have a gun at home, but without a FOID, I still can't go out and buy one, legally transport it to/from a range to practice, etc. Operating a radio transmitter has to do with Federally regulated frequencies and electronic equipment and high voltages. Not the same thing and not free speech or right which shall not be infringed. "The only thing necessary for the triumph of evil is that good men do nothing"
"People willing to trade their freedom for temporary security deserve neither and will loose both"
Out of curiousity, do we know what happened that got her charged? The feds don't charge for an amateur radio license. Any fees are for the test and are charged by a Volunteer Examiner Coordinator. Find a VEC who will do it for free, and you're good to go. I'm not sure about other radio licenses though. Having to pay and ask for permission from the ISP makes it a privilege and is treated by politicians in this state as a privilege which can easily be revoked by the ISP and in some cases the right has been taken away for traffic offenses which have been discussed on this board. Can't wait for the Supreme Court to invalidate all these Unconstitutional laws paid by the anti Constitutional rights people who want total control. Edited by Hipshot Percussion, 21 March 2019 - 03:53 PM. Now that I think about it, this could potentially have some far reaching effects. Such as anyone that gets "red flagged" having to turn their guns in to the police if their significant other doesn't have a FOID. A motion to appeal was filed on 11/20/18. Then there will be the reply brief from the defandant and then, there will be a reply from the state to which they will dawdel and most likely ask for an extension. So may not get before the Court till October. Right about the time New York is being heard. So depending, we could go up after New York. And have the benefit of those orals. and depending on how long delayed, could even see a ruling in the interum. this may toss a monkey wrench into some of those things going on at the capitol. Two pieces of good news in one day with regard to 2A? Top notch work! I'm glad we're helping her out with a new attorney and it's a shame the old one is retiring, sounds like they're great whoever they are. 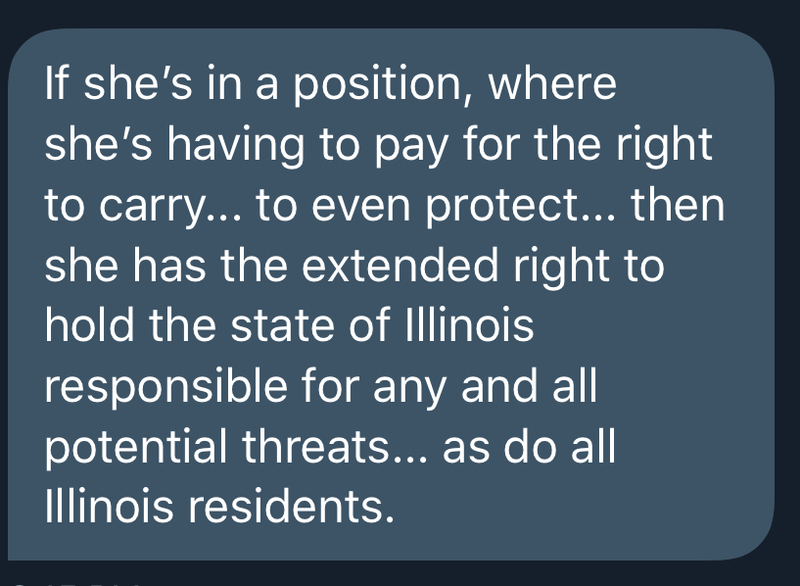 Rather than a go fund me, we would rather see donations to IllinoisCarry marked Brown case. me too. only in this context! This is awesome. I hope the plaintiff uses the other SCOIL ruling to help them out. The next step (if it played out that way) would be to litigate the fact that if defendant Brown can't be legally required to have a FOID card, then neither can anybody else. Exactly. Even those who yell fire in a movie theater never lose their right to free speech. My guess is that because this was a criminal case, her attorney's primary duty was to his client. Sounds like a move in the right direction but as we all know, the courts take their own sweet time and we all know the state will fight this with every method (legal or not) they can come up with. We must keep pushing it and keep their feet to the fire. I think we should demand all the money we had to pay for the FOID crap returned to us with interest!